This week, MeldaProduction offers 50% off its MAutoDynamicEq, MVintageRotary, MStereoGenerator and MTransient plugins. Tokyo Dawn Labs has updated the Standard and Gentleman editions of TDR Nova to v1.1.0. Until the end of the month, McDSP offers 50% off its AE400, ML4000 and SA-2 plugins. The Plugin Alliance offers a specially-priced bundle including the Alpha Compressor & bx_dynEQ V2 - but be quick, offer ends today. This Saturday's Plugin Alliance X-Mas Calendar door has opened and revealed the bx_dyneq at 84% off, hence available for $49. After three weeks of rehearsal claiming that "every Friday is Black Friday", Plugin Alliance has revealed its final offers for the d-day. 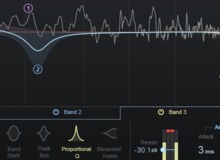 Tokyo Dawn Labs has released its new parallel dynamic equalizer Nova in two versions, one of which is free.